Popular trail close to town. Can be a good half day, all day, or overnight hike. Follows Indian River and its East Fork through 75-150 year old second growth and old growth temperate rainforest for approximately 4.5 miles to a 70 foot waterfall. A portion of the trail passes by a muskeg with views of the Sisters. Getting to the falls and back in 3 hours requires a quick pace with little time for relaxing and/or enjoying the scenery. A typical pace with time for breaks is 5-6 hours. This hike can also be done as an overnighter. There are a couple of decent locations to set up a tent near the falls as long as the river is not in flood stage. The first 3 miles or so have a very low upward grade overall with occasional very short steeper ups and downs. After gaining only about 400 feet in the first 3 or 4 miles, the grade increases noticably over the last mile of the trail to gain approximately 400 additional feet before reaching the falls. A short distance before the falls, the trail crosses a (usually) dry wash with brush on either side. The trail goes a couple steps up the wash before passing through a short section of brush. In some conditions, it may not be obvious where to go. 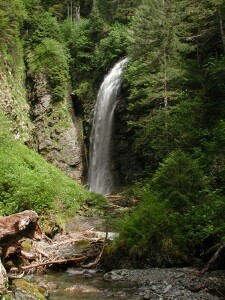 The trail is well maintained most of the way to the falls. The last mile of the trail is less maintained, but still in decent condition. In winter sections of the trail (especially bridges) may be quite icy. During exceptionally heavy rainfall, portions of the trail may flood (this occurs primarily in the fall). There may be an occasional tree that has fallen across the trail and not yet been cut away. Snow is usually off the trail by March, but in exceptional years I have seen snow at the falls in June. It may be necessary to make your way through trees that have fallen in Fall and Winter storms. Look for skunk cabbage shoots that have been nipped by deer. Flowers bloom throughout the summer. Trail is typically in its best condition. In early fall the smell of rotting salmon can be powerful. Most likely season for the trail to flood. In my experience the trail is still passable since the bridges over the main river are high enough so that no fast water creek crossings are necessary. During cold snaps, the falls may freeze. Icy bridges and board walks can be very slippery.